NETS Australia is the national exhibition touring network for the presentation and promotion of contemporary art, craft and design to regional audiences across Australia. We work with the extensive public gallery network in each state, and in the Northern Territory directly with communities, presenting the work of Australia’s leading curators, artists and crafts practitioners. Over the last three years, our exhibitions were seen by 1.77 million people, Australia wide—the majority of whom live in regional and remote areas. We employ more than 650 artists annually. 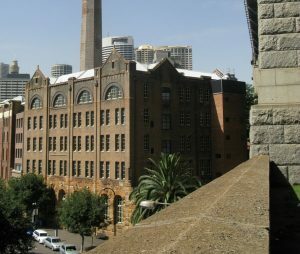 The Australia Council for the Arts’ recent announcement revealed that four of the organisations that comprise the NETS Australia network, servicing Western Australia, New South Wales, Queensland and Victoria, would no longer receive operational funding, has jeopardised scores of projects set to tour to regional Australian galleries in the coming months and years. Affected organisations include ART ON THE MOVE (WA), Museums & Galleries of NSW, Museums & Galleries Queensland and NETS Victoria. The Australia Council’s funding decision will result in reduced capacity for the four organisations, fracture the network and have an ongoing effect on Australia’s regional gallery sector. 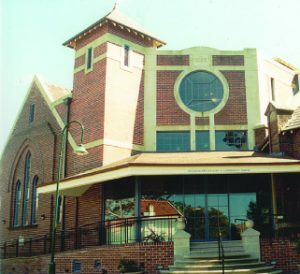 Of the 128 organisations to receive funding the only regional gallery supported with direct funding was the multi-artform Campbelltown Arts Centre. Regional galleries are among the most important and accessible cultural institutions in Australia and form a vital network, supporting artists and contemporary arts practices while nurturing audiences across the nation. This essential part of Australian arts infrastructure and programming has been passed-over for direct funding and the announcement raises major questions regarding the overall direction and intent of national arts funding. 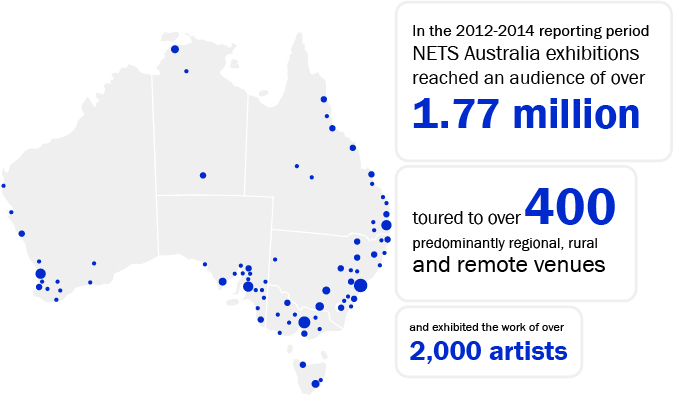 NETS Australia exhibition tours are planned 2-3 years in advance to meet the strategic planning and programming needs of many of the smaller and regionally based galleries, museums, arts centres and Aboriginal art centres. The removal of operational funding past 2016 for these crucial organisations will result in the inability to deliver planned tours or to pay the artists, curators and arts professionals NETS Australia employs across the country. In addition to the impact on program capacity and our ability to deliver planned tours, the loss of ongoing operational funding places many NETS Australia jobs in an extremely vulnerable state. The loss of specialist tour management staff will result in the loss of entire NETS agencies in many instances, effectively rupturing the national network and national coverage. We call on the Federal Government to reinstate funding to the entire network through the Australia Council in order to maintain the stability of contemporary visual art touring nationwide and ensure the continued delivery of this vital service to regional, remote and metropolitan audiences.